Mick Moloney Tribute to Harrigan and Hart at Symphony Space Thursday! How It’s New York: Well, it’s Mick Moloney, who’s really the person to know in New York Irish music. He teaches at NYU, he’s an NEA Heritage Award winner, he’s the guiding light behind the Masters in Collaboration series at Irish Arts Center, who presenting this event. Also, it’s at Symphony Space which is one of New York’s best places to see and hear music, poetry, performance of all kinds. Also, it’s a tribute to early leaders of musical theatre, and what’s more New York than that? The event is a copro with several New York institutions– others include Glucksman Ireland House NYU, American Irish Historical Society, Bowery Alliance of Neighbors, City Lore, Lower East Side Tenement Museum. Cordelia Mulligan has badgered her husband Dan into moving from their old homestead on “Mulligan Alley” to a deluxe apartment in the upper east side. Forced to put on airs by Cordelia and her newly moved in family (! ), poor beleaguered Dan is left yearning for the good old days of his old neighborhood. Something has to change – but what will Dan do to find happiness and to restore wedded bliss? Premiering in 1880, The Mulligan Guards’ Surprise was the fifth in Harrigan’s popular “Mulligan Guard” series. Featuring familiar characters like “Planxty McFudd” and memorable songs such as “Never Take the Horseshoe from the Door,” it delighted audiences both uptown and down during its long run at the Theatre Comique. In the 1870s, decades before George M. Cohan burst onto the Broadway stage, the songs of his hero Edward “Ned” Harrigan, Irish-American tunesmith and playwright, were the toast of New York. 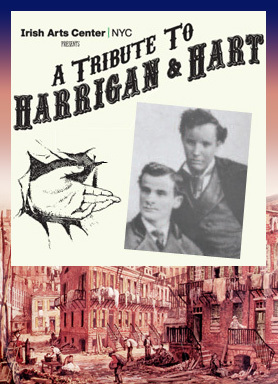 Harrigan’s ballads of the working class immigrants – filled with lovable and good humored characters like Dan Mulligan and his wife Cordelia, John McSorley, the owner of McSorley’s Irish Ale House, Tammany Alderman Old Boss Barry, and Mary Ann, the schoolteacher – mirrored his own mercurial life, and provided the foundation for an entirely novel genre of musical comedy on the American stage. On the hundred year anniversary of the death of the beloved Ned Harrigan, Mick Moloney and friends return to Symphony Space with a night with Harrigan, Hart, and musical collaborator David Braham. The performance captures the excitement and humor of the times and salutes its importance in the formation and growth of American musical and theatrical culture.